Simple Syrup NF to Quiet Coughs?!? I’ve seen several headlines trumpeting that over-the-counter cough syrups are no more effective than water. The headlines are based on a study performed at the Pennsylvania State College of Medicine and published in the electronic version of the July 2004 Pediatrics. I disagree with the headlines and the conclusions. In the study, the researchers followed about 100 children, ages 2 through 18 who had coughs for around 4 days. About 1/3 of the kids were given one dose of cough syrup containing dextromethorphan (DM) thirty minutes before bed, about 1/3 were given an antihistamine cough syrup (like Benadryl), and about 1/3 were given a placebo. All of the children had significant improvement in their coughs after their single dose. But no significant differences were found between the three groups – leading to the sensational headlines (although the children who got the antihistamine cough syrup did, on average, appear to sleep better). What does this all mean? First, the number of kids in the study was so small, that there is only an 80 percent chance that a true, significant difference between the treatments could have been detected statistically. The study could easily have missed the truth – especially if cough syrups work better for select groups of kids, perhaps at a particular age or with a particular kind of cough. Even if it were true that all three treatments were equally powerful, the study might suggest that a child’s mind is effective at relieving coughs, provided that the child is given something that seems like a real medicine. This could be an important trick for exhausted families! Or maybe the placebo syrup they used in the study is actually effective against coughs! 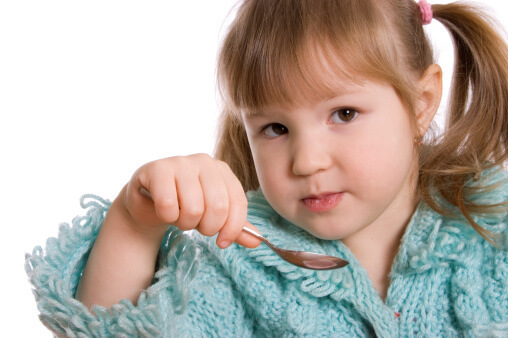 The children in the DM group got up to 30 mg of DM; those in the antihistamine group got up to 50 mg of antihistamine; but those in the placebo group got thousands of milligrams of sugar in the form of Simple Syrup NF – a mixture of sugar and water that is 85 percent sugar. Perhaps the sugar load and recovery thirty minutes before bed relaxed the children and relieved their coughs. We know that even a 12 percent solution of sugar can be a powerful drug, relieving measurable pain by half during a circumcision. Perhaps this placebo syrup functioned as a drug. Whether it was the sugar or the children’s minds at work, the syrup dramatically relieved coughs, and could be a gentle, inexpensive first line treatment for coughs from viral respiratory infections. A spoonful of sugar may do more than just help the medicine go down! The next time one of my children has a mild cough, I’m going to try a spoon of an Italian flavored syrup to see how it works.